1951, previously covered saw the forceful emergence of Charles de Gaulle’s RPF with 21.7% of the popular vote. However, less than five years later, the Gaullist movement which had marked French politics since 1947 was, by all accounts, practically dead. Yet, only a bit more than two years later, Gaullism was resurgent with the birth of the Fifth Republic. After the RPF in 1951, the novelty of 1956 was the emergence of the Poujadiste movement (mouvement Poujadiste), named after its founder, Pierre Poujade. Its emergence marks the first post-war far-right movement to grow in France, and the first far-right movement in the ‘modern’ sense – that is, rid of its pre-war monarchist or elitist-nationalist overtones. Its emergence, however, is all the more puzzling given that the years 1953 to 1955 were, in the most part, synonymous with economic growth, rapid development and also the stabilization of prices following the inflationist years which had directly succeeded the end of the war. Usually, it is economic instability and recession which has allowed for the emergence of the far-right in France. France in the post-war era, like most of western Europe, was undergoing rapid economic transformations, the most notable of which were urbanization and a shift away from family businesses or farms. The primary victims of the rapid economic changes were individual farmers (agriculteurs) and small shop-owners (artisans et commerçants). As a kind of petit bourgeois, the shopkeeper or merchant is at the confines of the middle and lower classes, not entirely bourgeois like those above him but not entirely working-class (or populaire) like those below him. In a certain way, he is constantly fearful of proletarization or déclassement. In this vein, the shopkeeper, merchant or small-town employee – republican, egalitarian and fiercely individualistic – have always been wary of socio-economic changes which always threaten to crush him. He is not a capitalist like the upper or middle bourgeoisie, because he feels his way of life threatened by the “aggressive capitalism”. He is not either a natural revolutionary, because he resents ‘proletarization’. Unsurprising, therefore, that these instinctively conservative (in the pure sense of the term) and individualistic voters should offer a natural breeding ground and captive clientele for all sorts of populist conservatives, the Georges Boulanger of times past and the Le Pens of today. 1956 was a period of rapid economic growth in France, especially with the emergence of large commercial surfaces, supermarket and price-point retailers – known in France in 1956 as the prisunic (equivalent of dollar stores in North America). Supermarkets and price-point retailers were a direct threat to small-town shops, with the individual butcher stop, the bakery or the delicatessen. Besides these broader factors and the social psyche, there was a key contextual factor at work here in 1956. In 1953, Antoine Pinay’s government had succeeded in dramatically reducing inflation – from 12% in 1952 to -1.8% in 1953, then 0.5%-1% in 1954 and 1955. Inflation had been high in the post-war era, peaking at 59% in 1948 and never dropping any lower than 10-11%. The main benefactor of inflation was the small shopkeeper, who amassed more and more wealth and cared much less about taxes given that it was paid with depreciating money. These businesses had benefited spectacularly from inflation, but they had failed to adapt to modern economic conditions of retail. The Poujadist movement was the child born of deflation and the stabilization of prices. The traditional literature treats the birth of Poujadism as an anti-tax revolt (révolte du fisc), but the tax revolt which started brewing in 1953 was more the reason of Poujadism’s birth than its deep cause. Inflation had made taxes bearable, deflation made them unbearable. A state of affairs intensified by the government’s “fiscal Gestapo” which strictly enforced the collection of taxes. The Union de défense des commerçants et artisans (UDCA) was created in 1953, as a corporatist union founded by Pierre Poujade, a stationer from Saint-Céré (Lot), with his great oratory talents and room-filling charisma. Derided as fascist, true in part, it is fairer and better to view the UDCA was a defensive reaction by small-town shopkeepers, merchants and small farmers who were attached to the founding republican values of private property, individualism and small community but who were almost condemned to disappear in the wake of France’s economic evolution in the post-war era. Depending on your perspective, the instinctive conservatism of yesteryear had perhaps been transformed into a reactionary movement, violent reaction to a ‘natural evolution’ of things. For Poujade and the UDCA, the culprits were the same: the big businesses and corporate leaders, le fisc, the revolutionary trade unions, the left and its anti-individualism, the corrupt parliament and the regime of parties, foreigners and all those who were “selling off” France and its empire (especially Algeria); all with a dose of conspiratorial antisemitism, attacking the Jews who allegedly owned the big business and big retailers but also thinly veiled jabs at Pierre Mendès France’s Jewish faith. The surprise of the January 1956 was the Poujadist movement, whose lists (Union et fraternité française, UFF or UDCA etc) won 51 seats and some 11.5% of the popular vote. The map below shows the results of Poujadists by 1936 constituency. Gray departments had no Poujadist lists. For those of used to the tidy and orderly map of the French far-right in its FN incarnation, the first thought which comes to mind upon seeing this map is a very puzzled “what the hell is this mess?” Indeed, when we’re used to the tidy map of the FN and its bases east of the Le Havre-Valence-Perpignan line, this map is an disorderly mish-mash of colours all over the place with little pattern. What is even more puzzling is that the Poujadists, oft called the ancestor of the FN – with reason – should have a map which is diametrically different from that of the far-right as we would learn to know it some 30 years later. The Poujadists are almost totally absent from a line going from Le Havre to Belfort, where the FN today flexes its muscles the best. Certainly some of the Poujadist strongholds such as the Vaucluse, Gard and Hérault have always given the FN strong showings, but other strong points – Maine-et-Loire, Charente-Maritime, Indre-et-Loire, Deux-Sèvres, Aveyron, Gers and even Isère to an extent – are not places where the FN does particularly well. The most basic explanation for the Poujadist’s success would be to conclude that they simply took the succession of the Gaullists. It is not a ridiculous proposition. The RPF in 1951 and the Poujadists in 1956 both appealed to a certain conservative anti-system and anti-regime vote – both were in direct opposition to the Fourth Republic and the rhetoric of the Poujadists in 1956 vis-a-vis the ‘regime of the parties’ and the anti-parliamentarianism were quite similar to the Gaullist rhetoric of 1951 which targeted the regime of the parties. A cursory look at the raw statistics leads us to the same conclusion: besides the MRP, all other major forces (PCF, SFIO, Radicals, moderates) maintained or built on their 1951 electorates in 1956. The MRP only fell from 12.5% to a bit less than 11%, and the MRP had little in common with the Poujadists. However, the Gaullists won 21.7% in 1951 but their successors in 1956 won 4.5%. The far-right and Poujadists won 12%. We could conclude, pretty easily, that while not all Gaullists voted Poujadist, most Poujadists had voted Gaullist some four years prior. Problem solved? No, we’ve only dug ourselves into a hole. If you remember the 1951 map of the RPF’s strength, we had seen that its bases had been concentrated almost quasi-entirely in northern France or what was occupied France in 1941. It had been absent from the bulk of southern France. In contrast, the Poujadists were more geographically spread out but they had their big strongholds (Vaucluse, Hérault, Gard, Aveyron) in southern France and only the Maine-et-Loire was a stronghold of the RPF and Poujadists. It is possible and even logical that the Poujadists received the support of many voters who had voted RPF in 1951. But like Boulanger in 1889, Poujadism cut vertically across all established political parties. He even took left-wing votes. In most cases, the main victims of Poujadism were the right. The return of Gaullist voters to their traditional right-wing (moderate, MRP) roots likely hide compensated loses to the Poujadists. There were, after all, key differences between Gaullism and Poujadism. Gaullism, through its leading figure, appealed widely to a certain conservative electorate, through its emphases on order, hierarchy and stability. Through its historical roots, it likely appealed very much to those who had been the fiercest of résistants during the War. On the other hand, Poujadism did not have a similar appeal to a conservative electorate fond of order and stability but rather appealed to another electorate, this one either apolitical or weakly politicized, anti-parliamentarian in its sympathies and quite keen to Poujadism populism and nationalism. In addition, often derided as fascist (and its leader as ‘Poujadolf’), the Poujadists were more likely to appeal to those more supportive of the Vichy regime and its traditionalist, “old France” rhetoric. Finally, Gaullism was in some ways a right-wing reformist movement in 1951 despite its Bonapartist overtones, it appealed to modern and industrial France. Poujadism was in many ways reactionary, the last-straw defense of a drowning type of old and traditional France. It had little in its rhetoric to appeal to modern and industrial France. Poujadism through its roots in the UDCA and Pierre Poujade carried a distinctive appeal to shopkeepers and merchants. I think it quite fair to assume that most shopkeepers and merchants voted Poujadist. For curiosity’s sake, I attempted to compare the Poujadist vote by department in 1956 to the percentage of artisans, commerçants et chefs d’entreprises in each department in 1968 (the earliest I have departmental census data for). It isn’t perfect, the two data sets being 12 years apart, but the general pattern in terms of distribution of artisans/commerçants can be reasonably expected to have been similar in 1956. In general, there seems to be a general increase in Poujadist votes as the weight of artisans/commerçants increases. But there are some big outliers: the best Poujadist department (Vaucluse, 22.5%) had only 12.3% of shopkeepers and merchants in 1968. Similarly, the highest percentage of shopkeepers and merchants in 1968 (Alpes-Maritimes, 16.2%) gave the Poujadists only 7.3. I calculated the correlation coefficient to be 0.31, indicating a very weak medium positive correlation. It is even stranger when you take only departments with over 12% of artisans/commerçants in 1968, the correlation is actually negative: -0.35! In those with over 13% of artisans/commerçants, there is a strong negative correlation again: -0.68. While it likely that a good number of Poujadist voters were small or medium business owners in small towns in rural ‘declining’ France, its success cannot be explained solely by that factor. In departments where the Poujadists did least well, it is likely that their success was largely limited to the UDCA’s base social category. But the Poujadist success was built on a heterogeneous base of support, especially in the Midi and the centre-west. By its form as a conservative populist reaction to rapid industrialization and “aggressive capitalism”, the Poujadist rhetoric was not only a sectional message designed for one social group, namely shopkeepers. Besides the growth of mass retail and large commercial surfaces, the other victim of deflation post-1953 were small landholders – agriculteurs exploitants. Small landholders, owning and cultivating their own parcel of land, were the product of the Revolution and the rural bedrock of the Republic in the 1870s. Like shopkeepers, small landholders were not particularly affluent but by their ownership of land they were (in most cases) instinctively conservative and deeply attached to the republican values of private property. But like shopkeepers, they were the ‘forgotten’ victims left behind by economic modernization. Inflation had been advantageous for farmers who had gotten artificially rich. Deflation brought along a massive drop in prices, and thus a loss in revenue for farmers. Inflation had been advantageous for farmers not only because they got rich but also because it had provided them with the revenue to pay for expensive new, modern machinery. The drop in prices post-1953 meant that this revenue dried up, and small landholders found themselves struggling to continue the ‘silent revolution’ in French agriculture. In many cases, this sped up the (inevitable?) decline of small property and the amalgamation of several unviable small properties into larger, modernized exploitations. Owners of small family farms and small business owners, had, in many cases, many shared common interests even beyond politics. In a small town feeling, they knew each other and were allied and linked to each other. In a certain sense, one’s destiny impacted the other’s destiny and they were perhaps even liked to a certain extent. Poujadism should not be understood solely in terms of a single class’ defensive reaction, which it was in part, but as being a broader movement of resistance to economic modernization. André Siegfried had talked about Poujadism as being a rear-guard’s defensive reaction pitting rural peasant against cities, the province against Paris, the artisans against factories, of regions in decline against booming neo-industrial regions and of the individual against “an invading socialist state”. No surprise then that Poujadism viewed in those terms would carry an equally as powerful appeal to those who in 1956 suffered a plight similar to that of the shopkeeper. In the Orléanais, the Beauce and the Brie, Poujadism appealed to rural workers in the wheat basket of the country. In the Berry and parts of Champagne, Poujadism appealed to poor peasants in declining regions with an outdated agricultural economy. In a region stretching from continental Brittany to the Anjou, Poitou and Charentes, Poujadism broke cleavages such as the all-important religious cleavage to appeal to regions where rural poverty was everywhere a reality, mixed in (in certain cases) with a local base of shopkeepers. In the Languedoc and especially the Vaucluse, the strength of Poujadism was furthered by the local crisis in the wine industry which swelled the ranks of the discontent. The Poujadists, judging simply from an unscientific inductive observation of the map, seem to have enjoyed some success with wine growers in the Loire valley, the Bordelais and Beaujolais but far more limited success with those in Bourgogne and Champagne. So far we have added one variable to our explanation besides shopkeepers, which had a 0.31 correlation. We have added the variable of revenue. Measured against the individual average revenue in each department in 1951 (measured with France being 100, and departments being either above or below 100 based on individual revenue), we find a negative correlation of -0.27, indicating that Poujadists did better in departments with lower individual revenue. But the correlation is rather weak. In some isolated areas like the Aveyron, the Alps or Isère, Poujadism was a reaction of ‘regions in decline’ as Siegfried had noted. 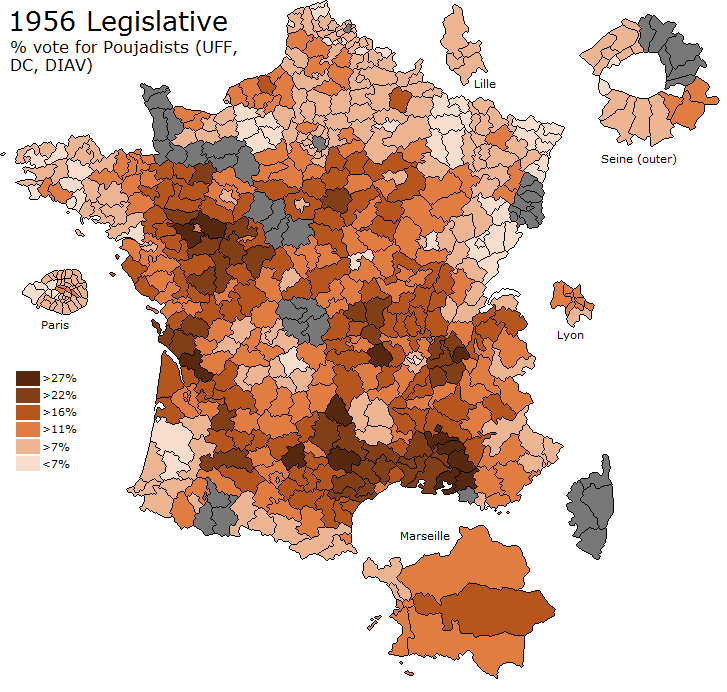 The Aveyron’s population declined by 4.9% between 1946 and 1954, and the Poujadists (18.8% of registered voters in the department) did best in those more mountainous areas who suffered the highest decline. In taking only those departments whose population declined between 1946 and 1954, the correlation between population decline and Poujadist vote is 0.53, a pretty strong correlation. But it is not universal: Lozère had the steepest decline at -9% yet the Poujadists won only 8% of the vote. The Cantal and Haute-Loire both declined by more than the Aveyron, but had weaker Poujadist results (11%). Local factors, some of them political such as other incumbents, lists and the strength of the Poujadist slate must be considered. Isère is a particularly interesting department. Its population grew by 9% between 1946 and 1954, and it was quite industrialized, yet the Poujadists did particularly well with 15% of the vote (registered voters). Isère’s population growth and industrialization in that era was widely seen as being particularly rapid and regionally uneqal. It came mostly to the benefit of Sud Isère and the Grenoble region, and to a lesser extent the industrial centres of the Nord Isère in proximity to Lyon. It left behind declining rural regions lying between the two urban centres of attraction of Lyon-Vienne-Bourgoin and Grenoble. The overall correlation between population change and Poujadist vote is weak but negative (as expected) at -0.26. The link between industrialization, as measured by employment in industry or transportation in 1951, and the Poujadist vote is more significant and negative (as expected) at -0.35. Poujadism, born as anti-parliamentary movement, was perhaps ultimately unable to survive the contradiction between its aim and founding value (anti-parliamentarianism) and being a parliamentary actor. Its emergence as a last-straw reaction to industrialization and modernization which would only intensify in the 1960s precluded it from being anything more than a temporary feu de paille (flash in the pan) in the realm of French politics. The emergence of the Fifth Republic and the shift away from the parliamentary partitocratie killed off a lot of the movement’s anti-institutional and anti-system rhetoric. Gaullism would re-emerge as an attractive and viable political option a bit more than two years later. The only thing left of Poujadism, it seems, is the use of “Poujadist” as a blanket term for most populisms of that kind. But despite it going down in history as a feu de paille, as a curiosity of history but ultimately a futile and quixotic single-issue movement, Poujadism has had a deeper impact on French politics and the far-right in France. Not only because Jean-Marie Le Pen was elected as a young UFF deputy for the Seine in 1956. The rhetoric behind Poujadism with the attacks on the corrupt political establishment, the big corporations, the foreign profiteers, aggressive nationalism and part of wider movement which appealed to those who felt ‘forgotten’ by the political elites and those who fell behind economically. What is pejoratively called the petite bourgeoisie, or more specifically the shopkeepers and merchants who formed the backbone of the UDCA, have remained one of the FN’s backbones though the FN has never been as closely identified to that social category as the Poujadists were and their influence on the modern FN is fading, though certainly present. To a good extent, the FN has won votes from voters who are neither part of the unionized working-class or the wealthier upper middle-classes, and who are at odds both with the traditional right in its old elitist Orleanist incarnations and with the left in its old traditional sense described, by Poujadists, as ‘anti-individualists’. I think the FN vote in places like rural and exurban Champagne, Bourgogne and Picardie are quite reflective of a rural, “forgotten” electorate which is not particularly well-off and gets put off by both the right and the left. Not working-class in the industrial sense, but of some small town working-class tradition. These particular types of people might not have voted Poujadist in 1956 (although some certainly did), but I feel that the rhetoric which appeals to them on the FN’s behalf is similar to the Poujadist rhetoric of 1956. Pierre Poujade quickly broke with his young MP, and disavowed any links between his movement and the FN. Poujade was not a politician, he was far more of a corporatist unionist with a talent for oratory. But his movement had deep repercussions on the FN in terms of ideology and orientation. The Poujadist vote in 1956 was remarkable for its strength and its homogeneity across the country, but in the details the Poujadist vote is also remarkable for its composition’s heterogeneity. In almost each region, it seems as if the makeup of the vote was different and as if the impetus to vote for Pierre Poujade’s movement varied significantly from region to region: wine crisis here, population decline there, shopkeepers and merchants angers there, falling behind on industrialization here, structural rural poverty there. Despite its short life as a political movement and regardless of whether you have a positive or negative view of Poujade and his movement, Poujadism had a deep impact on the French far-right after 1945. Posted on December 15, 2011, in Far-Right (FN etc), Fourth Republic (1946-1958), Maps. Bookmark the permalink. 3 Comments.